Water. 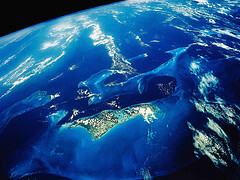 The substance that covers about 70% of the earth’s surface makes the earth the “blue planet” when viewed from space. Water. One of the essentials for life allowing us and many other life forms to exist on this planet of ours. Increasingly a scarce resource that we were warned that we need to take better care of. 70% coverage of the earth’s surface, you say? That’s a lot. Well, here’s another image to put next to the images of the blue planet as seen from space. Yes, that small blue ball – with a radius of just 700 kilometers – represents ALL the water on the earth’s surface. That small blue ball is our life ball. How carefully are we playing with this blue ball?